Eight Kannada writers have received the Jnanpith Award since its inception. To Santheshivara Lingannaiah Bhyrappa aka S.L. Bhyrappa goes the distinction of becoming the very first one to bag the equally respected Saraswati Samman instituted by the K.K. Birla foundation, for his 2002 novel Mandra. Bhyrappa who worked as a coolie in Bombay Central railway station, as a coach driver in Bombay, as a waiter in village restaurants, as a gatekeeper in village tent cinemas, and sold sherbet in village fairs and agarbathis for a living, before becoming an academic and writer, accepted the high honour in New Delhi on Wednesday. I cannot reflect on my literature without reminiscing my life. I was born into a very poor family in a village in Karnataka. My mother bore the brunt of earning and looking after the children as my father was an utterly irresponsible person. When I was ten years old, plague visited our family attacking me, my sister who was married just fifteeen days earlier and my elder brother. Both of them died within a span of one hour and somehow I survived. After two years my mother too died of plague. I had to continue my education in a town four miles away from my village with free food obtained in seven houses as was the tradition those days. When I was fourteen my sister aged four died of cholera. When I was fifteen, my brother aged six died of some undiagnosed illness. I carried his dead body on my shoulder to the cremation ground and burnt it assisted by a sweeper, a government servant of the very low caste in the hierarchy. All these experiences started to bother me with the questions: what is the meaning of death? When I was studying in Mysore for my Intermediate, I met a professor of philosophy in the University and posed my problem. He gave me a Kannada translation of the Kathopanishad with a commentary. I read it with great concentration but could not find the answer to my nagging question. Again I approached the professor and expressed my inability to understand the teaching of Yama to Nachiketa. The professor said they were questions which required a systematic study of philosophy for my BA. I followed his advice and took to study of philosophy in all seriousness for the bachelor’s and master’s course. I studied philosophy with total concentration for twelve years as a student and eight years as a teacher and researcher in the subject. I did my PhD in aesthetics, on a comparative study of truth and beauty, and continued my research on beauty and goodness. By this time, I realised two things: philosophy, which included all branches of knowledge in both India and ancient Greece, is now shed of cosmology, epistemiology, psychology and even many questions of ethics giving place to modern astrophysics, theoretical phyiscs, economics, sociology, experimental psychology and jurisprudence. So, philosophy now remains a study of values. I also realised that though the Vedas and the Upanishads form the foundation of Indian philosophy, it is Ramayana and Mahabharata which analysed and critically concretised our national ethos. By this time I had written my first major novel Vamsha Vriksha. This critical experience mingled with the understanding of how values and even disvalues of life are concretised in Ramayana and Mahabharata made me realise that my vocation was not formal, dry, academic philosophy but exploration of human experience through the medium of imagination, that is literature. Further I realised that the two most important steams of Indian philosophy, Vedanta and Buddhism, and their values emanate from the same source, viz death. Siddhartha left his family at the sight of death and arrived at the philosophy of impermanence of life. The most important Upanishad, Katha, also starts with the problem of death and arrives at the philosophy of impermanence of mundane life and therefore asks us to seek what it calls the permanent. Anyhow, the Indian value-consciousness awakens with the awareness of death. Since I started writing and until now the general atmosphere in the country has been making a demand on creative writers to subserve literature to the cause of change, modernity and amelioration of the downtrodden. Having had a background of philosophy, that too axiology, i.e. study of values, I have much sympathy with these expectations. But I consider it a disservice to both the values if one is made subservient to the other. Not that literature is against change, modernity or amelioration, but it should maintain its identity and freedom. Literature itself is a vast, possibly the widest field in which all the values of life can be explored than in any other intellectual activity; in it the demands of political parties and social activists are also accommodated but with a higher vision and more critical analysis. The ameliorists and activists try to constrict the aim of creative writing to what they consider the most important to the present and pressure the writer to write only in the way they think best. They attack the writers who do not fall in line as bourgeoise and rightists. They do not realise that social issues change every couple of decades and literature restricting itself to these issues becomes obsolete. Throughout I stood firm and maintained my creative and intellectual freedom. I am glad that of my recent novels, Mandra is selected for the Saraswati Samman. I have tried to explore the relation between art and other values of life through a musician, his surroundings and persons who come in interactive contact with him. Throughout the novel music itself is the main character. I chose music as the principal motif because it is is the purest and therefore, the most raw and powerful medium when compared to other arts like painting, sculpture and literature. It moves through all the basic and mixed rasas ranging from the depth of Mandra to the height of Taarataara. Mandra is a state of total inwardness, i.e. meditation. Also read: Does Kambar deserve Jnanpith ahead of Bhyrappa? This entry was posted in Issues and Ideas, Media and tagged Avarana, Churumuri, Karan Singh, Karnataka Photo News, KPN, Mandra, S.L.Bhyrappa, Sans Serif, Saraswati Samman, Shobhana Bhartia, Upanishads, Vamsha Vriksha, Vedas. Bookmark the permalink. ← POLL: Are 90% of Indians “mentally backward”? I am very glad that Dr. SL Byrappa received the Saraswati sanmaan (which is misspelled by everyone, including Churmuri. I heard the same story from Dr. SL Byrappa, I did a personal interview of him in Silicon Valley in 1996. Even though death is very painful to a close relative or someone who has close feelings to the dead person, death is so very common, so much so that every one who is born also dies, making both birth and death equal in number. However, death has a higher focus than birth! People like Dr. SL Byrappa are destined to be great, against all odds in life. I always wonder whether such odds make a great person also! ಅನುಭವವನ್ನೇ ವಸ್ತುವನ್ನಾಗಿಟ್ಟುಕೊಂಡು ಅಥವಾ ವಸ್ತುವಿನ ಆಧಾರವಾಗಿಟ್ಟುಕೊಂಡು ಶುದ್ಧ ಪ್ರಾಮಾಣಿಕತೆಯಿಂದ ಕಲ್ಪನೆಯ ಬಲೆಯೊಳಗೆ ವಸ್ತು, ಕಥೆ, ಪಾತ್ರ, ಗತಿ ಇವುಗಳೆಲ್ಲದರ ಸಂಶ್ಲೇಷಣೆ ಮಾಡಿ ರಸವನ್ನು ಸೃಷ್ಟಿಸಿ ಓದುಗರಿಗೆ ಕೊಟ್ಟಿರುವ ಕನ್ನಡದ ಬಹಳ ಕಡಿಮೆ ಲೇಖಕರಲ್ಲಿ ಶ್ರೀ ಭೈರಪ್ಪ ಒಬ್ಬರು. ಅವರು ತಮ್ಮ ಕೃತಿಗಳಲ್ಲಿ ಹಿಡಿದಿಟ್ಟಿರುವ ಅನುಭವಗಳು ಓದುಗರ ಸ್ವಂತ ಅನುಭವಗಳೊಂದಿಗೆ ತಾಳೆ ಹೊಂದಿ ಓದುಗರ ಮನಗಳನ್ನು ಮಿಡಿಯುವದರಿಂದ ಅವರ ಕೃತಿಗಳು ಜನಪ್ರಿಯವಾಗಿವೆ. ನನ್ನ ವೈಯಕ್ತಿಕ ಅನುಭವವನ್ನೇ ನೋಡಿದ್ದಾದರೆ ನಾನು ಯಾವ ಪುಸ್ತಕಗಳನ್ನು ಓದಿದರೆ ಸತ್ಯದ ಸ್ವರೂಪ ಎದ್ದು ಕಾಣುತ್ತದೆಯೋ, ಅದನ್ನು ಹೇಳುವ ಎದೆಗಾರಿಕೆ ತೋರುತ್ತದೆಯೋ, ಅದರ ಅಭಿವ್ಯಕ್ತಿಯಲ್ಲಿ ಕಲ್ಪನೆಯ ಮತ್ತು ಭಾಷೆಯ ಮೋಡಿ ಇದೆಯೋ, ರೂಪ ಮತ್ತು ಚೌಕಟ್ಟುಗಳಲ್ಲಿ ಬಂಧಿತವಾಗಿದ್ದರಂತೆ ಕಂಡರೂ ಓದುತ್ತ ಓದುತ್ತ ಆತ್ಮಸಾಕ್ಷಾತ್ಕಾರದ ಮಹದಭೀಪ್ಸೆಗೆ ನೀರೆಯುತ್ತದೆಯೋ ಅಂತಹ ಪುಸ್ತಕಗಳನ್ನೇ ನಾನು ಅರಸಿ ಹೋಗುತ್ತೇನೆ. ಭೈರಪ್ಪನವರ ಕೃತಿಗಳಲ್ಲಿ ಅಂತಹ ಯಾತ್ರೆಯ ಅನುಭವ ಆಗುತ್ತದೆ. ವಸ್ತುವಿಲ್ಲದೆ ಕಲ್ಪನೆ ಮಾತ್ರ ಇದ್ದರೆ ಕೃತಿಗಳಿಗೆ ಗತಿ, ಆಳ, ಗಾಂಭೀರ್ಯಗಳಿರುವುದಿಲ್ಲ, ವಸ್ತುವಿದ್ದು ಕಲ್ಪನೆ ಇಲ್ಲದಿದ್ದರೆ ಕೃತಿಯು ಶುಷ್ಕ ಬೋಧನೆಯಂತೆ ಕಾಣುತ್ತದೆ. ವಸ್ತುವಿನ ಅಡಿಪಾಯ ಅನುಭವ ಆಗಿಲ್ಲದಿದ್ದಲ್ಲಿ ಗ್ರಂಥಾಲಯದ ಪುಸ್ತಕದ ಬದನೆಕಾಯಿಯಂತೆ ಕಾಣುತ್ತದೆ. ವಸ್ತುವಿನ ಆಯ್ಕೆ ಇದ್ದು ಅದರ ನಿರೂಪಣೆಯಲ್ಲಿ ಕಲೋಪಾಸಕನ ಬೆಳುದಿಂಗಳಿಗಿಂತ ಧ್ಯೇಯವಾದಿಯ ಓಡಲುರಿಯೇ ಹೆಚ್ಚಾಗಿದ್ದರೆ ಓದುಗನ ಮನಸ್ಸಿನಲ್ಲಿ ರಸಾಭಾಸವಾಗುತ್ತದೆ. ಭಾಷೆಯ ಶ್ರೀಮಂತಿಕೆ ಇಲ್ಲದಿದ್ದರೆ ಎಷ್ಟೋ ಪರಿಕಲ್ಪನೆಗಳನ್ನು ಪುಸ್ತಕದಲ್ಲಿ ಇಳಿಸಲೇ ಆಗುವುದಿಲ್ಲ. ಭಾಷೆ ಅದ್ಭುತವಾಗಿದ್ದು ಸಾಧಾರಣ ವಿಷಯಗಳನ್ನು ಪದರ ಪದರ ಬಿಡಿಸಿದ ಮಾತ್ರಕ್ಕೆ ಅದೇನಿದ್ದರೂ ಬೌದ್ಧಿಕ ಕಸರತ್ತಾಗಬಹುದು. ಪೂರ್ಣದೃಷ್ಟಿಯನ್ನು ಪಡೆಯಲು ಸತ್ಯದ ಎರಡು ಮುಖಗಳನ್ನೂ ನೋಡಲು ಕಲಿಯಬೇಕು. ‘ಎಂತ ಹುಚ್ಚು ಜನರು ಇವರು ಕೊಚ್ಚೆಯನೇ ಕಾಂಬರು. ಕೊಚ್ಚೆಯುಂಡು ದಡದಿ ಬೆಳೆದ ಹಚ್ಚ ಹಸಿರ ಕಾಣರು. ಅದೂ ಸತ್ಯ ಇದೂ ಸತ್ಯವೆಂಬ ಅರಿವೆಯಿಲ್ಲದೆ ಬಾಳು ಬೆಳೆಯ ಬಲ್ಲದೆ?’ ಎಂದು ರಾಷ್ಟ್ರ ಕವಿ ಜಿ.ಎಸ್.ಎಸ್ ಬರೆದಿರುವ ಪದ್ಯ ನೆನಪಾಗುತ್ತದೆ. ಭೈರಪ್ಪನವರ ಕಾದಂಬರಿಗಳನ್ನು ಓದುವಾಗ ಇಂತಹ ದೃಷ್ಟಿ ಕಾಣುತ್ತದೆ. ಇಂತಹ ಪ್ರಶಸ್ತಿಯು ಭೈರಪ್ಪನವನ್ನು ಹುಡುಕಿ ಬಂದಿದೆಯೇ ಹೊರತು ಪ್ರಶಸ್ತಿಯನ್ನು/ಕೀರ್ತಿಯನ್ನು ಅರೆಸಿ ಹೊರಡದ ಆದರೆ ಅರಸಿಬಂದ ಕೀರ್ತಿಯನ್ನು ನಮ್ರತೆಯಿಂದ ಸ್ವೀಕರಿಸಿ ತಮ್ಮ ಕೃತಜ್ನ್ಯತೆಗಳನ್ನು ಅರ್ಪಿಸಿರುವ ಭೈರಪ್ಪನವರಿಗೆ ನನ್ನ ಅಭಿನಂದನೆಗಳು. SLB is truly a titan among jealous and worthless fleas. Grammatically SAMMAAN is the correct usage. Churumuri was right. Check with Sanskrit grammarians. A great honour to Kannada and Kannadiga. Kudos to Prof. SLB. Ditto Vikas and feel even more blessed, as i was present during yesterday’s felicitation. Jnana ‘peetha’ sikkadiddaroo, ‘Saraswati’ anugrahisidaralla! Santosha. SLB’s life is a great story of survival and excellence. Bitthi is such an inspiration for all of us. Congratulations to bhyrappa sir for a fantastic literary career . What is truly special about bhyrappa is the wide range of topics he has written novels on. A thorough professional with penchant for research ,it is a befitting recognition to the most widely translated novelist in india.if not for his endorsment of some of rss and narendra modi idealogies,he is a role model for writers and novelists. My heartiest congratulations to Sri Bhyrappa on this honour he so richly deserves. I have just started to wrestle with Parva- tough going but a fascinating read. Like all great writers SLB too has hisfair share of crap. But when he writes well he writes really really well. Congratulations on being conferred the Saraswathi Samman. Wow! Kudos to SLB!! If anyone has a link to a video of him delivering this speech, can you please paste the same here ? Now, Jnanapeetha must come to him and honour itself! ಕೆಲವು ಸಾಹಿತಿಗಳು, ಸಾಹಿತ್ಯ ಹ್ಯಾಗಿರಬೇಕು, ಒಳ್ಳೆಯ ಸಾಹಿತ್ಯ ಎಂದರೇನು ಎಂದೆಲ್ಲಾ ಭಾಷಣಗಳನ್ನೂ ಕೊಟ್ಟು, ಬರಹಗಳಲ್ಲೂ ಚೌಕಟ್ಟು ಹಾಕಿರುವುದು ನಮಗೆಲ್ಲಾ ಗೊತ್ತಿರುವ ವಿಷಯವೇ. ಈ ಮುಖ್ಯ ಪ್ರಶ್ನೆಗೆ ಒಂದಲ್ಲ, ಸಾವಿರಾರು ಉತ್ತರಗಳಿವೆ; ಎಲ್ಲವೂ ಸರಿಯಾದ ಉತ್ತರಗಳೇ. ಆನೆಯೆಂದರೆ ದೊಡ್ಡ ಬೀಸಣಿಗೆಯಂತೆ ತೋರುವ ಕಿವಿಯೂ ಹೌದು; ಕಂಬಗಳಂತೆ ಇರುವ ಕಾಲುಗಳೂ ಹೌದು; ಇತ್ಯಾದಿ, ಇತ್ಯಾದಿಗಳೆಲ್ಲವೂ ಸರಿಯಾದ ಉತ್ತರಗಳಾದರೂ, ಸಾಹಿತಿಗಳೂ ಒಂದು ರೀತಿಯ ಕುರುಡರೇ! ನನ್ನ ಉತ್ತರ: ಸರಿ; ಆದರೆ ತಪ್ಪು! “ಯಾಕಮ್ಮಾ ಇಷ್ಟೊಂದು ಒಲವು ಇಂದು ಮಾತ್ರ?” ಎಂದೆ. ನಕ್ಕು ಪ್ರಾಸದ ರೆಕ್ಕೆ ಕಚಕ್ ಮಾಡಿಬಿಟ್ಟಳು! Dr.Murthy sir, very well said. No doubt an excellent writer and a deserved winner. Kannada missed many such awards in past. DVG, TPK and many more deserved Jananapeetha and SS. I am now happy that the true Saraswathi’s son is awarded the right award. HEARTY CONGRATS TO S L BYRAPPAJI, always thinking why this historian/author is not in hight-light either by any function felicitation or by any award, Now my own ecstasy is calmed down. Wishing him further awards in his healthy life, expecting more books too…. Wow! What a star really SLB is. Coming from such poverty, no one to guide and losing the loved ones one by one but still showing such a dogged determination to succeed! Hats off sir! Cheated of Jnanapeeta by underservinng and fraudulant URA and GK, caravan moves along. I wish the Jnanapeeta team wakes up and recognizes the talent and the works of SLB. Dr.Murthy, why are you using this feedback column to promote your blog & your writing ? Lets stick to discussing SLB here. Feel free to Send your articles to any blog of your choice for publication instead of piggybacking on a discussion column on SLB and his works. When I was studying in Second B.Sc, in Yuvaraja’s college Mysore. Film shooting of Vamsha vriksha was going on.Then I heard that movie was based on the novel written by Sri.S.L.Byrappa. In our college, we have formed a study circle comprising like minded students interested in Art and literature. This novel encouraged us to have series of discussion over the various issues raised in the novel. Either the college park or Kukkerahalli tank bed was our ideal place for discussion.This novel took us to an unxplored world of religion and our mundane practices.This novel encouraged us to read more on religion, Dharma, our rituals, our beliefs. The thirst for such information still lives with me. In chickamagalur, during 2004, fan club of Sri.S.L.Byarappa was in existance.One Sri.Jayanna char who was a sculptor,was the leader of the club and he lended me all the novels of Sri.S.L.Byrappa and every day he use to discuss the various topics dealt in the novel. I cherish those days,even today. Sri.S.L.Byrappa’s novel takes into a Aura that we know, but we have failed to recognise and visualize its existance and its impact. He deserves both the samman and the Gnanapeetha award. Alas he has been branded by our own elders. This is the saddest part of our Kannada literary world. His novel is being read by one and all and Byrappa’s thoughts lives in common mans heart. Long live Sri.S.L.Byrappa. A jnana “PEETHA” sikkisi kollodu,Saraswathi “sammaan” anugraha vagodu. Congratulations to my beloved teacher and my favorite novelist. Like Yakla says,Jnaanapeetha will gain more credibility the day it has SLB on its list of award winners. I was very much exited to see an advertisement in kannada Prabha on front half page of Government of Karnataka regarding the awarding of Saraswati Samman to Dr. SLB. I was quite relieved to a great extent that at least when other people have recognised the talent of Our beloved Dr. SLB our Govt at last has got up from its long slumber and recognised that we have a talented writer by name Dr. SLB in karnataka. Now at least it is inbument upon Governement to ensure that our talents do not go unrecognised. but I will make it very clear that whether Govt recognises or not people have already recognised what Dr. SLB is. Whether he got jnanapeetha or not, he has got a permanant place in the Hrudaya Peetha of Kannadigas. Let the Govt do some good works with our talents before it is too late coming out from their daily petty politics. Where are the voices of people who said Bhyrappa is no novelist now? Indeed a very good speech if one has not read SLBs writings & has clear conscience. But this hypocrite never practiced what he is preaching in this speech. Most of his writings are maligned by narrow vision of hinduthva. Those who have similar inclinations adore him. As everyone knows, there is a lobbying for all kind of awards. SLB has succeeded in getting ‘Samman”. I m sure he continues lobbying for Jnanapeeta through his chelas. His recent relentless tirade against congress in kannadaprabha is already fetching him Rs 500,000 & a felicitation inside the vidhanasoudha from a BJP govt. At this rate Jnanapeeta is not too far. Good luck SLB & pray for BJP govt in the center !! Leftists like you will get consumed by your own hatred and jealousy. You are no Neelakanta to keep that kind of poison in your heart (or throat). Truth is very unsettling! Is it not? Whether it comes though his novels or his articles in Kannada Prabha. It is time to celebrate. Do not turn iit into a character assasination session. The person who has already filled with his own way of looking at the things with coloured rather tainted visions, no force on the earth can satisfy him. 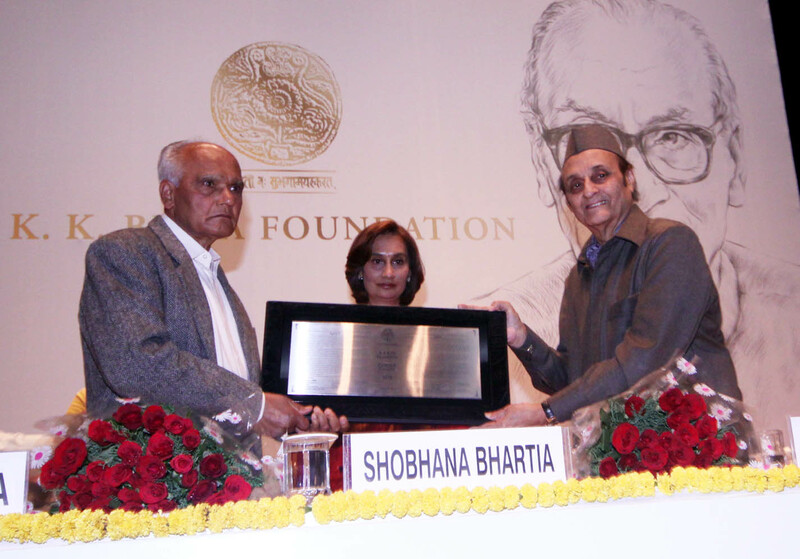 Had Dr. SLB lobbied for any award it would not have been diffiicult for him to get them much much earlier. Whatever the awards he won it has come to him searching because of his talents and not for any lobbying as basely alleged by our friend. Dr. SLB and lobbying are two different poles. Let us celebrate that a deserving writer from Kannada has got this unique award. If at all Mr.
Somashekhar has gone through the process of selection for this award, he wouldnot have made such a silly comment. O GOD FORGIVE THE IGNORANT, AND GIVE HIM ENOUGH OPPORTUNITIES TO COME OUT OF HIS IGNORANCE. It looks like your did not understand my poem and writing. The poems I write are to the context. I am NOT promoting the blog. The poem has all the needed context for the topic of Dr. SLB. Please do not read further….till you have read the above link. Now tell me, a man of this calibre, a rare gem indeed has produced nothing but laughable truth? That is all you can come up with ? That means you are also entitled to your viewpoints. And so is Bhyrappa ….but he is not one-sided by any stretch of imagination. What you call as objectivity is a fragile castle in the air built that is just heavy enough to support your comfort and tolerance levels. In other words as subjective as you are. Where did BJP and Modi come from? I will leave them alone. @ Vadirajsharma, whatever you referred to me in your comment, I can easily say it back to you. That is very silly. I fully understand that there is no agreeing point between us, but I have a right to say what I feel about SLB. Do not try to abuse a person who has different opinion than yours. Right from our rajyotsava award to nobel prize there are lobies which work at different levels. If you do not know about it, I pity you ! @ Narshardula. I agree with what you said about objectivity, writer should have creative freedom. But why does SLB tries to legitamise some of his novels by giving list of books he has researched to write them. What about his venomous articles against other religions, you do not apply objectivity there ?. Are they not one sided. If you can not see the naked truth, no one can help you. Thanks for the link from the Kannadaprabh, now everyone knows about the credibility of that paper, especilly after lokayukta report. I really wonder anyone here has read Rhamath Tarikere’s article about avarana in the book ‘avaranada anavarana’. I know it will be brushed aside as leftist tainted vision. No one can deny bhyrappa’s literary greatness ,it is well established. A writer is also a citizen of this country entitled to opinions on politics, but problem arises when a writer starts endorsing organisations like rss,bjp which have indulged in dirty corrupt practices. There was also the episode where bhyrappa hailed modi’s industrial policy in gujarat,but the truth is forcible unscintific land acquisition in the guise of development is the most inhuman thing one can think of and when a sensitve,creative person like bhyrappa supports it,it definitely shocks a fan like me. Your blind opposition to land acquisition is getting a little tiring. It is as if every time you hear the phrase ‘land acquisition’, you start itching. How do you know that the land acquisition in Gujarat is “forced and unscientific”? I haven’t heard any protests in the recent past – the most recent one was the Narmada andolan. It may come as a surprise to you, but the country needs to acquire land for industry and infrastructure. Land acquisition cannot be avoided, it is the need of the hour. If anything, the pace of acquisition needs to be increased fourfold. I am all for giving fair compensation to those who lose their land. Let them be compensated according to market rates, and a little more. Let no one hoodwink them and underpay them. But land acquisition cannot be stopped, and should not be stopped. We need new roads, railway lines, industries, factories, townships… The nation cannot afford to perpetuate poverty any longer. While I deeply admire Bhairappa as a novelist for his skills as a writer, I do have my share of differences with some of his stance. In a recent KP interview he talked about Regionalism and is of the opinion that it’s only Karnataka where this feeling of regionalism exists and is not seen in states like Punjab, Maharashtra and Andhra. There was a near secession movement in Punjab which took even the life of Indira Gandhi. Maharasthra has 3 regional parties and every now and then we hear cases of north indians getting beaten up in mumbai. Andhra’s regional parties have played big role in Central politics during the NDA tenure. Has anything of this sort happened in Karnataka at all ? From where Mr.Bhairappa drew this wild conclusion that this feeling of regionalism is rampant in Karnataka alone? On another count, he talks about having words of Sanskrit origin for all scientific literature in all Indian languages and says it will help in translation of science literatute developed in one language to another. Basic question is why do we need science literatute? Is it to help the kids to grasp the concepts and help in improving their conceptual thinking? or to help some people in translating from one lang to other? One small example is: Concave and Convex Mirrors are thought in Kannada medium as peena darpana and nimna darpana which nobody can understand, instead of straight forward kannada words like ubbugaaju or taggugaaju. SLB advocates having Sankrit words for aiding translation instead of thinking about how to make our kids learn science better. This kind of misplaced thoughts make me wonder whether he truely seeks truth in everything or is it just selective truth seeking. For ur kind information please read mallika sarabhai ,an eminent dancer and activist ‘s articles and u will know. That state does not have an ombudsman like lokayukta to deal with misdeeds of government there. It is thee right of a farmer to defend and protest landacquisition and it was not right on bhyrappa sir to give gujarat example for good governence. The most fascinating aspect is even thee most harsh critic of bhyrappa never belittles his literary genius but may differ on other aspects. My favourite novels tantu, daatu and mandra. What Bhyrappa referred to in that nterview was about a pattern of thinking only that originated in Tamil Nadu in politics and has come to Karntaka in literature. This is the context he quoted in his interview: “He went to a literature conference, first it was with English professors and he enjoyed it. It was a discussion on literature purely as an art. Then he met Kannada group and was looking forward to enjoying it more obviously being a Kannada writer but the jokers (this is my word) from Kannada literature world surrounded him asking questions on his works- why he does not write in another way, does not improve society etc.no one had any passion to talk about literature..” So he was not referring to political separation at all. There are jokers like this in politics also in Karnataka who are also reponsible for playing the cheapest of the cheap antics like they played against BSY when he said …..this is no dombaraata…..” when they asked the community of “domabru” to protest against against him. Such extreme narrow mindedness centered around instant gratification for hate can not breed good leadership. ಪಾಪಿಯ ಬುದ್ಧಿ ಕಿರುಕುಳ ಕೊಟ್ಟೀತು ಆದರೆ ಮಾನಭಂಗ ಮಾಡಲಾರದು. 3 years is name, 30 years is fame, 300 years is history and 3000 years is Homer. Kuvempu, DVG, KSNa, Bhyrappa, Bendre, etc(list not complete) have already made name and fame and will make history. Purandara dasa and Kanakadasa have made history. Mahabharata, Ramayana etc are more than Homer. One can have only his friends read his writings and hi friends can make a noise (the name gets noticed only because of noise) . If the noise is loud enough and especially ‘High-Decibel Denunciation’ of the likes of Bhyrappa he may even get an award. No one will remember him or the movements he propagates eventually. Such people should at least try to read Bhyrappa because ಪ್ರಮಾದ-ಜನ್ಯ ಪತನದ ಕ್ಷಿಪ್ರತೆ ಪ್ರಯತ್ನಾನಂತರದ ಪರಾಭಾವದಲ್ಲಿಲ್ಲ. everything in India wants to just get a tag of nationalism and get converted to delhi’s comforts. no one is worried about our language, our kids , our interests. everyone wants to grasp/cling to the notion of India. 1. You need help from going overboard. What PuttaNNa Kanigal did to kannada Cinema is treachery. What Master HIrannayya did to Kannada Drama is another treason, Too busy to list .. The various arguments of our friends are quite interesting. As a reader, it may not be necessary to go deep into the antecedents of the writer,his vision,his theories. I consider a book or an article as good, if the presentation,is understandable and touch my heart. From my boyhood, I have seen my elders, friends, read the novels to pass time, to update their knowledge.If the books leaves an impression, they were suggesting or recommending their friends and relative groups, to read that novel or article. Especially if it is a small locality or a village, mouth to mouth canvas of such novels, has increased the morale of the writer.If the novel reaches to nooks and corner, then the writer will be an hero. I feel , let us not worry more about the SLB’s theory, his understandings, his reactions.Rejection or acceptance or recognition lies with us. Any art (inclusive of writings) are the outcome of one’s feelings in any form of expression.Whether it is good or bad,its creator is least worried. It is the buyer or collector who has to think whether go for such acquisitions. Why should we blame SLB, let us look at his contribution to the Kannada literature.Critics are their to look at its quality, and its worth.Let us not brand him. Abhinandanegalu he deserved longback but got it very late i think saraswathi is happy because one of his beloved son has got it. Using Kannada words where adequate should be welcome. I personally like ತಾಯ್ನುಡಿ and ತಾಯ್ನಾಡು more than ಮಾತೃಭೂಮಿ and ಮಾತೃಭಾಷೆ. ಸೊಬಗು than ಸೌಂದರ್ಯ, ಪಡೆ than ಸೈನ್ಯ, ಹಾಲುಹಾದಿ than ಕ್ಷೀರಪಥ…. However, if some phrases / words are hard to make up in Kannada then we should borrow from Samskrita if they exist in samskrita like ‘ಕಿರಣ ಜನ್ಯ ಸಂಯೋಗ ಕ್ರಿಯೆ’ and ‘ಧ್ಯುತಿ ಸಂಶ್ಲೇಷಣೆ’ for photo chemical reaction and photosynthesis. Finally we can also borrow from English. Kannada Brahmanas and Marathi Brahmanas are the best in the world followed by Tamil Brahmanas. On a scale of 1 to 100, 1 meaning a Bengali ‘Chattarjees, Mukherjees and Banerjees’ and 100 meaning ‘Chanakya’ Kannadiga and Marathi Brahmanas are 100, Tamil Brahmanas 80 because they keep classical culture alive but have lost the ability to pronounce 50% of the sounds a human tongue and voice can produce. In my opinion Gowdas and Lingayats in karnataka also have a very universal outlook and far better people skills than Brahmanas. Gowdas are the best. Their ability to face reality and their killer instinct is second to none. Hindi or Samskrita or Tamil will not harm Kannada but English does. We can learn enough English to get jobs. Not beyond that. Individually people can learn English literature etc…whatever they want in private settings but not in schools up to 12th standard. There is a need to start a movement called ”ಕನ್ನಡಿಗರೇ ಕರ್ನಾಟಕ ಬಿಟ್ಟು ತೊಲಗಿರಿ’ in order to tame Kannadigas who want English only irrespective of whether they are Brahmanas or not. Wow! You are seriously prejudiced! You need to take a rehabilitation treatment! Jaathigu matthu illi nadeethiro charchegu enu sambandha buddhi? Kannadigarige irodu onde jaathi. adara hesaru Kannada. ಕೊನೇ ಪುಲಿಕೇಸಿ, ಒಪ್ಗಳ್ತೀನ್ ಸಾಮಿ..ನಮ್ ಜನ್ಗುಳೂ ಅಂದ್ರೆ ಕನ್ನಡಾದವ್ರೇ ಕನ್ನಡ ಬ್ಯಾಡ ಬ್ಯಾಡ ಅಂತ ಅಠ ಮಾಡ್ತವ್ರೇ. ಅದ್ಕೆ ಇಕ್ಬುದ್ ಬೇಕೂ ಅನ್ಸ್ತೈತೆ! S L Bhyrappa returned Re 5 lac awarded to him by Karnataka govt right back and asked the Kannada Department to use that as deposit to give scholarship to 15 Kannada medium school children…Details are in the link. Please read. Is there any one reporting it? Especially all the Left wing English Brigade? “GNANA PEETA” has lost its Precious value when undeserved people received the award through force / influence recent days. Why the Gnanapeeta Commitee have not seen the morvelous efforts of “DV Gundappa” in “Mankutimmana Kagga”??????? Not seen “Bhyrappa” for his great research work?????? Finally we can conclude that all these awards given based on Reservation not based on their contribution.